OMDC Recruitment 2019 - Apply Online for Apply Online/ Offline for Director (Production & Planning) Post in OMDC, Across India. 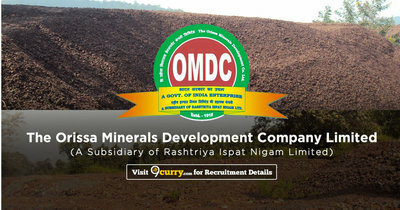 Online Applications are invited by Orissa Minerals Development Company Ltd from 25 Jan 2019 to 15 Mar 2019 03:00 PM for 1 vacancy. i) Graduate in mining with good academic record forms a recognised University/Institution. ii) Applicants holding MBA/PGDM qualifications will have added advantage. The applicant should have at least five years of cumulative experience in production/planning/management of projects during the last ten years in an organization of repute. Eligible candidates may apply online at OMDC s website (direct link is given below) from 25 Jan 2019 to 15 Mar 2019 till 03:00 PM. Candidates log on to http://www.oil-india.com/. Go to "New User" & Register yourself. After applying online applicants need to send application form along with all relevant documents to Smt Kimbuong Kipgen Secretary, Public Enterprises Selection Board, Public Enterprises Bhawan, Block No. 14, CGO Complex, Lodhi Road, New Delhi-110003. The application with all relevant documents should reach on or before 15 Mar 2019 till 03:00 PM. VIZAG Steel Recruitment 2019 - Apply Online for 10 MT Posts in VIZAG Steel, Visakhapatnam, Andhra Pradesh. Online Applications are invited by VIZAG Steel (Visakhapatnam Steel Plant - RINL) from 20 Jul 2019 to 09 Aug 2019 for 10 vacancies.